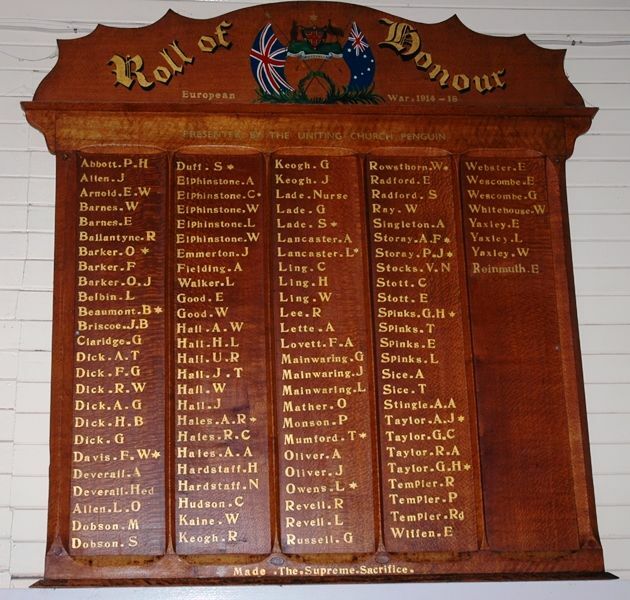 A dark wooden honour roll with 108 names in gilt lettering commemorates those who served in World War One. The Methodist church was crowded by a large congregation on Sunday night one the occasion of an In Memoriam service to those adherents of the church in the circuit who had enlisted for active service and had made the supreme sacrifice. Rev. Abbott then called on Mrs. James Storay (whose two sons had laid down their lives on the battlefields of Gallipoli and France) to unveil the district Roll of Honour, which had been placed in a commanding position on the western wall of the church. The roll of honour, the handiwork of Mrs. Norman Hall, has been greatly admired. It is of a simple yet effective design, carried out in silky oak, the lettering being in gold leaf.